How about a healthy 5-minute seafood dinner? We have an easy recipe for scallops you may want to consider. The season for Atlantic sea scallops will open next month in France and typically in December for the US. 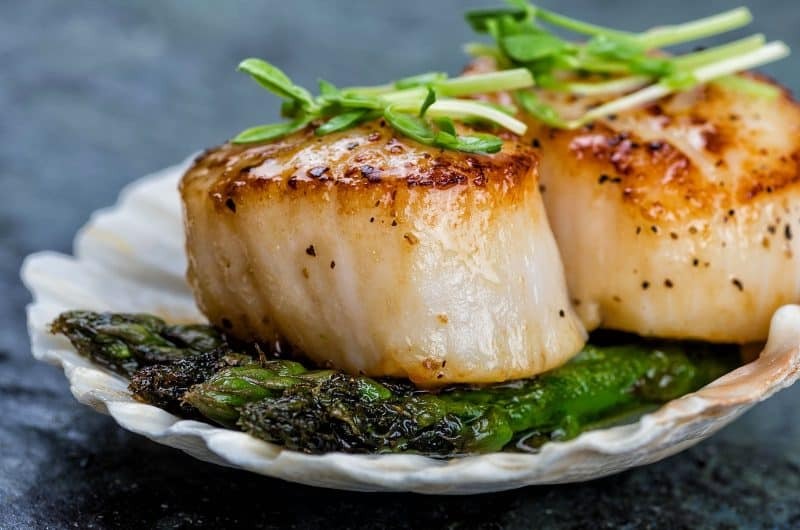 But you don’t have to wait, there are great quality options for frozen sea scallops and with Art of the Home tip on how to thaw scallops, it will be hard to tell the difference. Our recipe for scallops takes about 5 minutes to cook giving you more time to enjoy dinner with family and friends, definitely a plus! And consider this – scallops are an excellent low-fat source of protein, great for our health. Now, for a little French touch, we recommend using France’s favorite salt, the Guerande French sea salt (fleur de sel de Guérande) — simply close your eyes and you will feel you’re on the Atlantic sea coast of France (we do for fun – great way to travel cheap!). So check below for our easy quick low fat recipe for scallops and Art of the Home suggestions, including wine pairing. Enjoy and bon appétit!. Dry scallops with paper towel, they will sear better. Place scallops in a glass dish. Pour olive oil and sprinkle fennel seeds. Add minced shallots and garlic. Salt and pepper to taste. Gently mix. Cover and refrigerate for at least 1 hour. When the scallops are ready, heat large pan under high heat — preferably a saute pan but use whatever you have. When the pan is hot (pan needs to be very hot), place scallops on a single layer in the pan with a little bit of the marinade. We recommend using kitchen tongs not to damage the scallops. When you put the scallops in the pan, you should ear the olive oil of the marinade sizzle. Cook one side for 3 minutes, then when it is seared, turn over and cook the other side for 2-3 minutes. But watch closely and check coloring to make sure you flip them when you see that lovely crusty brown top. Overcooked scallops are rubbery (in fact less is better than more) so it’s important to closely monitor cooking time. Sprinkle chopped parsley (optional) on top of scallops. With the tongs, remove scallops from pan and serve on a bed of lamb’s lettuce (mâche) tossed in an olive oil-balsamic vinaigrette. Serve with a white Burgundy wine, a good Chardonnay , or semi-sweet (labelled “demi-sec”) champagne. Side dish options: delicious on a bed of leek fondue or with braised fennels — a great marriage.